Vox propellers have been designed and manufactured with one objective in mind - to maximize performance at the prop end, with the highest possible efficiency. 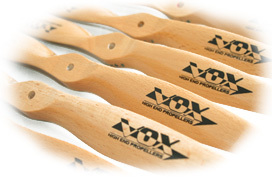 Vox gas propellers are made of laminated hardwood for added stability and strength. Designed for gas engines operation they feature heat and distortion resistance, low air friction (meaning they are relatively quiet) and greater thrust. Their accurate machining guarantees accurate flight performance - making them a perfect choice for IMAC and precision aerobatics.